I hope everyone is having a great holiday so far. Things are good here. I managed to find some time to do some stitching, and that always makes things better! This is another crewel work project. I really like working with the wools, but I still have a limited collection of colors. That will be changing soon! This was fun to work on. There are actually quite a few stitches squeezed in there. To be honest I wasn't 100% happy with the placement of the flowers, but I will make a few adjustments! I think there may be enough time to squeeze in one more project for 2011, but I will have to get going, time is getting short!! Happy new year! May it be the best one yet! I used Appleton crewel wools. They are sooo nice to work with. This time though I used linen, because I found out the hard way that it really isn't so easy to pull them through a tight, woven cotton - they just get worn fast. The size of this piece is about 5 inches. This project is a bit special for me because I just started with an idea, not a complete design drawn on fabric. I wanted a reindeer head, and I decided it needed to be a realistic shape rather than a cartoon. So I found a photo on Wikipedia, drew the head on paper and transferred it over. Then I added the leaves. I used the edge of the hoop to help me make a nice circle shape. Next came the ornament, then the candles. I tried a red for the inside of the candles, but it was too intense. Since I had no orange, I tried a dusty pink and that worked great. It looks like orange in the photo and in real life too. Funny how colors sometimes become what you want them to be. I then added the branches to anchor the candles and ornament a bit, then added the beads, and the little white stars and french knots. This was just lots of fun to make. It's a bit scarey in a way, just picking up the needle and stitching without a drawn pattern to guide. But there is something so fun about just letting the feeling of the embroidery guide you. I would encourage everyone to give it a try. You just need an idea to start with. I made this with crewel wools, so officially it's crewel embroidery. Just thinking about how my fall stitch school petered out a bit. I didn't quite carry it through to the end, but really it is just a beginning. I will be coming back often to this type of stitching. I hope this piece shows you that you don't have to do the traditional big flowers and leaves or birds with very long tails in order for it to be crewel work. There can be much, much more to this type of embroidery to learn - and for me, the exploration has just begun. I hope to be finding some time for my needle over the holiday weekend, so I will be back early next week! Until then have a great holiday!! Last week I got some new embroidery books! I love getting them. There is always much to learn and see in them. One of them is the new RSN Stumpwork book. It isn't a pattern book, but rather a book of stitches and techniques. The designs shown in the book are clean and more modern looking than a lot of the traditional stumpwork that I and many others have been doing. Anyways, here is a little project inspired by the book. The leaves are a new stitch I found in the book. It's really cool how the leaves turn out. They have a little extra dimension without being a full-out wired shape. To be honest I found the book's instructions a little lacking. I'll be back with more on these leaves soon. I'll definitely be making more of them. My ladybug has 4 layers of felt this time for a really nice rounded body. The little snail is my favorite. The body is a bullion knot with 3 different floss colors. The shell is 7 strands of 3 colors couched down in a spiral. Bullions on the brain. I've been seeing a lot of bullion knots in the projects I have been looking at in my ever-growing pile of embroidery books. So I think this is the reason that I have included them in 3 places in this little project. Actually the pink flowers were going to be standard "berries" with french knots, but after I made a ring of knots, something said no, we are going to try something different. So it became rows of bullion knots and beads. I will say if I had known that project would lead me that direction, I probably would have made different color choices, because maybe the pink flowers are just a little bit strong, just a little though. They are solid colors, but repeated in the project and with interesting textures, and so they work well enough with the other colors. The third set of bullions are the little sepals beneath the pink flowers or berries. When I added those, the whole thing looked much better. I've been a little slow lately. Maybe it's the short days and grayness - we are down to about 6.5 hrs of light now. Soon things will turn towards slowly lengthening days again though, and it only takes a few weeks before you start feeling the darkness lifting. I made this small embroidery for a change. I didn't follow a pattern just an idea. I call this embroidery "Autumn Nights". It didn't quite turn out as I envisioned, but it's ok. It was a little experimental, as these small embroideries are intended to be. I wanted the sky to feel like a cool sunset in the fall. The tree is couched down yarn. Then I added the first set of branches with linen thread. I thought it could be more interesting with further branching with 1 strand of cotton floss. I made the moon from angelina fibers. My first time using them. It looks a bit odd in the photo, much better in reality though. It doesn't really matter if the design isn't quite what I had in mind. It's actually quite fun just to pick up some thread and follow an idea and try some different things without being bound by a pattern. I would definitely recommend trying it. Don't worry if you are uncertain of the result. It doesn't matter. You will find it interesting in time when you look back on it. And the most important thing is to take the opportunity to try new and different things. 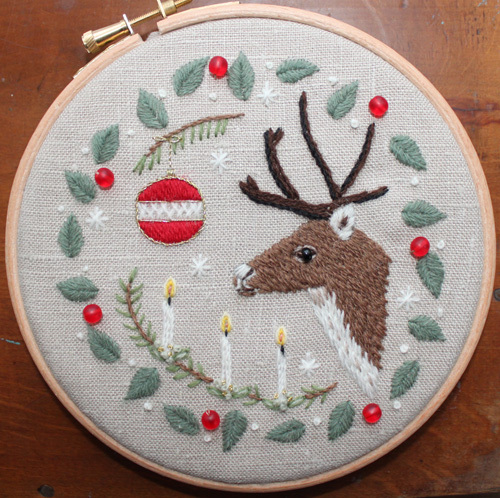 It's the only way to learn and make new and even better embroideries. I can't emphasize it enough, if you want to be able to incorporate new stitches in your projects, you have to learn them first, not just how to form the stitches, but how they look and feel. The best way is either sample cloths or small embroideries where you free yourself. Anyways, this would be an embroidery journal project, but I'm not "officially" starting until next month. In January the fun begins, and you are all welcome to join in whichever format you like!